Health nuts look away now! French toast is not particularly good for you at the best of times, but boyfriend-who-bakes and I have made it even less healthy and even more tasty by, you guessed it, deep frying it. Its one of those moments of heaven when you take a bite of perfectly cooked, crispy, golden french toast with a touch of cinnamon, icing sugar and honey. It really needs no garnishes, no toppings to disguise any imperfections in the cooking of the toast itself, my current pet peeve when buying french toast at cafés. Plus everything tastes better when you make it yourself, it just does, even if there’s no logical reason for it to be so. Don’t freak out now and tell me you don’t have a fancy deep fryer, it certainly makes it easier if you have one but it’s really not necessary. All you need is a pan deep enough to get about three inches of oil with a nice thick bottom. So no excuses for not trying this at home! 1. You’ll need to mix the egg, milk, sugar, salt and cinnamon in a bowl until combined. 3. Soak your bread in the egg mixture, I like it to be coated but not overly soggy. Then transfer into your oil, cook it until golden brown and remember to turn it but only once! 4. Get rid of any excess oil on paper towels. You could even have it with ice cream! What’s that, ice cream for breakfast? Bacon and maple syrup is another great option. 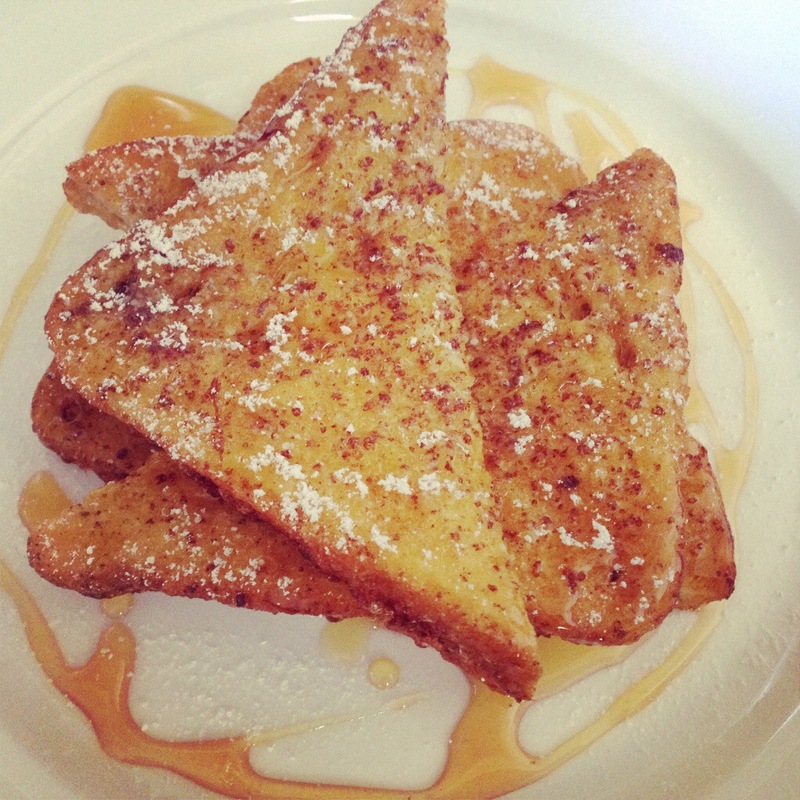 With french toast this good anything is possible ;).